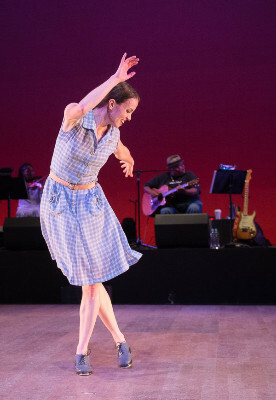 Michelle Dorrance. Images courtesy of the company. Photos by Christopher Duggan courtesy of Jacob's Pillow. 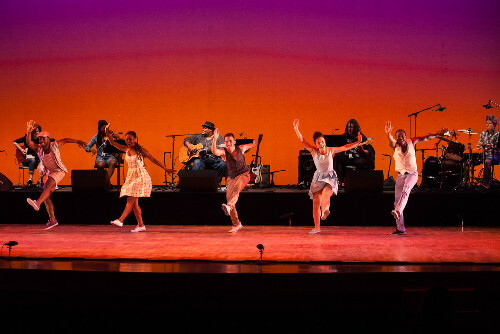 The Blues Project with the company of Dorrance Dance and live music from Toshi Reagon and BIGlovely premiered to rave reviews and sold out performances in the smaller Doris Duke Theatre at Jacobs’s Pillow in 2013. It returned last summer for another successful run. Yesterday we finally enjoyed The Blues Project during a matinee in the larger Ted Shawn Theatre. Just incredible! We were blown away by one of the most completely enjoyable and absorbing performances that we have experienced over several seasons of covering Pillow. It was particularly significant to see this event on Independence Day Weekend. Just a couple of nights prior we enjoyed an All-American program celebrating the launch of the Tanglewood/ BSO season. There was a similar feeling with this remarkable Pillow programming. 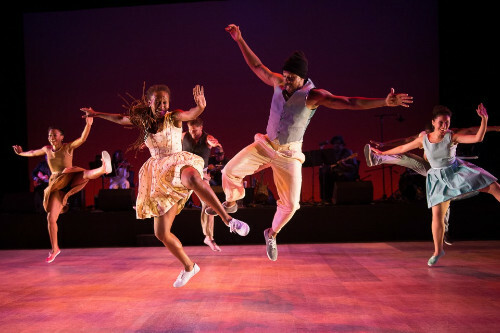 Truly, tap is paradigmatically at the heart and soul of American dance. It is as much a part of our vernacular heritage as Flamenco is to Spain. It is likely that tap originated with minstrel shows and may have deeper roots in African American traditions. 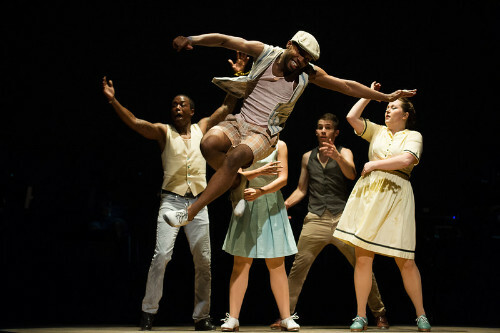 Tap has been a part of Broadway musicals and Hollywood films. Who will ever forget Bill Bojangles Robinson in his staircase duet with the juvenile star Shirley Temple? How many times did we see Sammy Davis, Jr. on the Ed Sullivan show performing with his father and uncle. Gregory Hines did much to preserve and highlight the tradition. 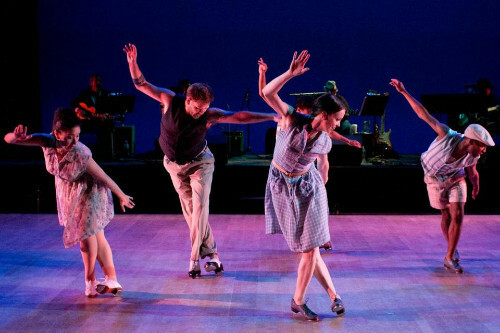 Now the innovative Michelle Dorrance and her remarkable company are taking tap to a new level. 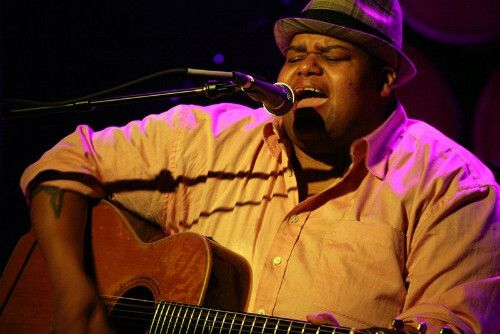 At Pillow there was a platform featuring Toshi Reagon and her five piece band with a blue light on the wall behind them. On her own we would have enjoyed just listening to Reagon. With a high, tender, piercing and lilting voice she brings a fresh approach to the blues. Her music is more ethereal and vulnerable than earthy. The band played a range of musical styles. Early on in the program Juliette Jones, in red spike heels, came down to mingle with the dancers. She played Appalachian fiddle as they performed a country inflected dance. It was an interesting sidebar of the program which could have been further explored. 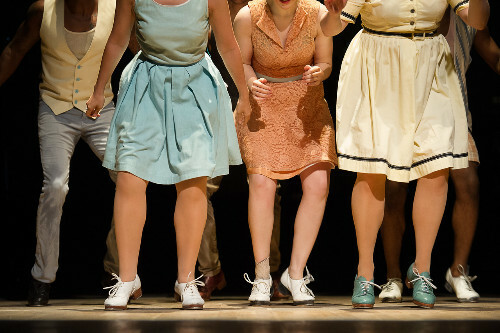 There was also a swing segment with the lindy dancers in sneakers. The tom tom rich drum solo of Allison Miller evoked the Big Band era style of Benny Goodman's percussionist Gene Krupa. The Blues Project seemed to alternate solos by Dorrance, Derick K. Grant, and the remarkable Dormeshia Sumbry-Edwards as well as ensemble pieces. There was an emphasis on individuality as all of the performers had their own specialties and variations. With the men this might be a series of splits or leaps. Some of the performers provided comic touches. There was often the sense of healthy competition as the dancers took turns pushing each other out of the spotlight. This friendly one upmanship is at the core of the cutting sessions and jams in the African American tradition of all night, after hours sessions, and rent parties. Some of the most thrilling moments were also remarkably simple. These occurred as interactions with Reagon singing and accompanying herself with poignant songs. Here Michelle Dorrance with great invention reacted to and improvised around what she was hearing. Often she clutched the hem of her skirt in one hand seemingly to make more room for her energetic dance. Mostly importantly Tap is both a visual and audible form of performance. We see the movement but also hear and follow the rhythm of percussive metal taps on the floor. There were microphones at the edge of the stage to pick up that sound. There was a constant smile on the face of Dorrance as she delighted in surprising us with unexpected movements. Her work contrasted sharply with Sumbry-Edwards. In a typical move Dormeshia would rapidly glide across the stage with blasts of rapid beats. Her feet never seemed far from the floor as she created sweeping textures of staccato sound. It was like a drummer making rim shots with the snare or beating on the high hat cymbals. She would pause and reflect on what she had done. Then launch into yet another variation. This was followed by ever more complex rhythmic variations. For a number of years Sumbry-Edwards was the private tap mentor to Michael Jackson. 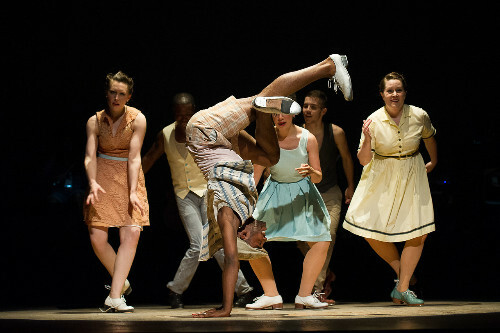 The unique approach of Dorrance is to allow each of the dancers to develop their own style and expression. Those who do not yet solo appear are in the process of development. Often a solo, which stunned the audience with subdued admiration, was followed by the full band backing an upbeat ensemble piece. The evening aptly demonstrated that there are as many forms of tap as there are dancers. The Dorrance approach is to allow everyone room to breathe, grow, and invent new expressions. We are told that there are improvisations and variations that make every performance fresh and unique. That explains the expression of wonder, surprise, appreciation and joy as from the wings we observed Dorrance watching the remarkable solo of Sumbry-Edwards. It just doesn’t get better.